Within a year of publication of Alvarez et al. (1980), the K-T boundary was discovered in nonmarine strata using palynology. The boundary sections discussed by Alvarez et al. (1980) are all in marine rocks, and that circumstance presented the possibility that the anomalous concentrations of iridium (and other siderophile elements) were somehow the result of marine depositional or diagenetic processes, rather than having been derived from an extraterrestrial object striking the Earth. Charles ("Carl") Orth of the Los Alamos National Laboratory quickly assembled a team of nuclear chemists and geologists to test that possibility by seeking an iridium-bearing K-T boundary in nonmarine rocks. An important member of that team was Robert Tschudy of the US Geological Survey. Orth et al. (1981) found what they were seeking in a drill core that penetrated a sequence of coal-bearing strata at York Canyon in the Raton Basin of New Mexico (Figure 4.3). They knew from Tschudy's previous palynological analyses of coal beds in another core that the new core would encounter both uppermost Cretaceous and lowermost Paleocene rocks. In the new core, palynology was employed to bracket the K-T boundary within an interval of about one meter, and gamma-ray spectrum-analysis was utilized to pinpoint the iridium anomaly. Following that discovery, further palynological and nuclear geochemical (neutron activation) analyses of the core showed that characteristic Cretaceous pollen species present in the core abruptly disappeared precisely at the level of the peak concentration of iridium. The abrupt disappearance of certain species of pollen was easily interpreted as evidence of the extinction of the plants that had produced the pollen, because those pollen species had long been known to be present in Cretaceous rocks but not in Paleogene rocks in western North America (e.g., Tschudy 1970). 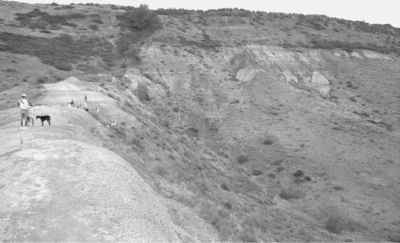 Furthermore, the observation that the microstratigraphic level of the disappearance of Cretaceous pollen exactly coincided with the geochemical evidence of an extraterrestrial impact was supporting evidence for the Alvarez et al. (1980) hypothesis. It was becoming evident that an impact was the cause of K-T extinctions, not only in the marine realm but also on land. 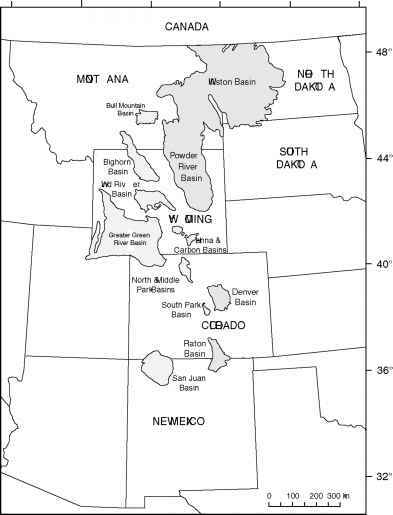 Figure 4.3 Map of the western United States showing sedimentary basins of Cretaceous and Paleogene age. Those containing K-T boundary sections (Raton, Denver, Powder River, and Williston) are emphasized by darker shading; see Chapters 6 and 7 for details. extinction in western North America was not coincident with the extinction of dinosaurs in that region. In his 1981 paper, Hickey cited as "in press'' data that he set forth in a more extensive paper that was delayed in publication for three years. Hickey (1984) is the complete survey of palynological and paleobotanical literature upon which the earlier paper was based. Interestingly, the data cited indicated that the magnitude of floral change across the K-T boundary was as much as 50% in some regions of the world, but he also cited a large number of non-North American palynofloral records that appeared to indicate little or no extinction. In retrospect, the resolution of many of these records with regard to the K-T boundary is at the stage level, and most of the studies were quite preliminary as to floral composition. In the same book Catastrophes and Earth History - The New Uniformitarianism that carried the paper by Hickey (1984), Tschudy (1984) published a paper specifically on the global palynological record at the K-T boundary. His paper was based on a survey of the literature published through 1977 supplemented by his own unpublished data from western North America. In commenting on the palyno-logical record of extinction of the flora in that region also noted by Hickey (1984), Tschudy stated that the Late Cretaceous palynofloristic province had "virtually lost its identity'' at the K-T boundary (Tschudy 1984, p. 333). That region aside, he acknowledged the inadequacy of the data available for addressing effects of the boundary event on plants, because no detailed evaluation of the whole flora across the K-T boundary existed. Tschudy also observed that on a global scale, palynology suffered from the absence of accurate stratigraphic control. Nonetheless, he concluded that "no prominent world-wide extinction of land plants at the end of Cretaceous time can be postulated from an examination of the pollen and spore record'' (Tschudy 1984, p. 332). Clearly the paper was written years before it was published (as was Hickey's) because ironically it appeared the same year as Tschudy et al. (1984), the description of the fern-spore spike at the K-T boundary (see Section 5.3), which made Tschudy in effect a leading supporter of the impact theory. Thus, early responses to the Alvarez hypothesis from the fields of paleobo-tany and palynology were ambiguous if not negative. However, new evidence was soon to accumulate that would change the paradigm of the fossil plant record.